Louise has started appealing for prizes for this year’s Winter Hay Appeal so that we can ensure we have plenty of hay for those in our care this winter. 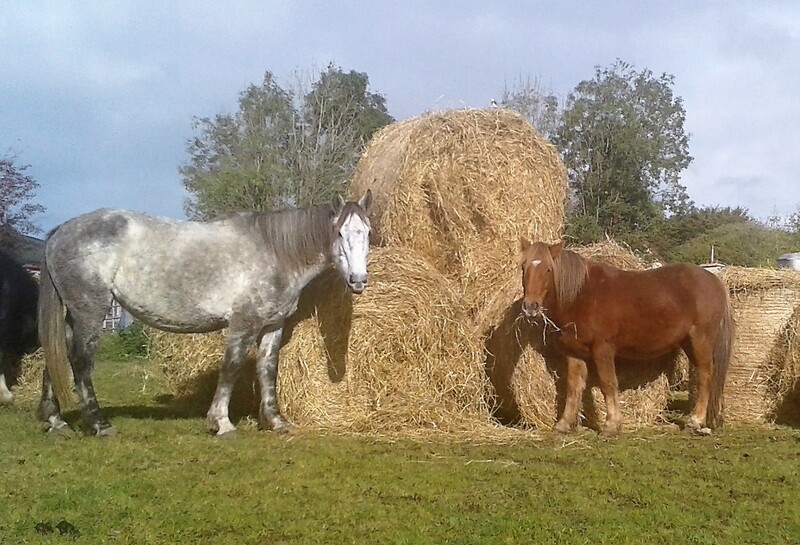 In 2015 we spent over €8,000 on hay, last week’s delivery cost €1,100 and we will have one of those bills every month from now until April at the earliest so any help you can give would be hugely appreciated. Send Louise a message on our Facebook page or email her louise@burrenrescue.com if you want to donate a prize or you can sell raffle tickets, etc. 3. 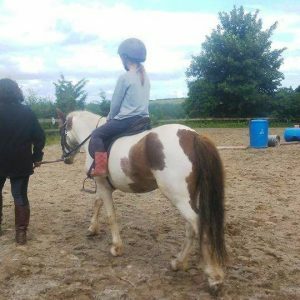 Another piece of good news was that Finn, who went to Tipperary Mountain Trekking Centre for training this past summer, made such a good impression on Clare and all at the trekking centre that he is staying with them. We hope he continues to enjoy many years of children fussing over him and them having fun together. 3. Vet bills ….. got to have that one in ‘the bad’ section. 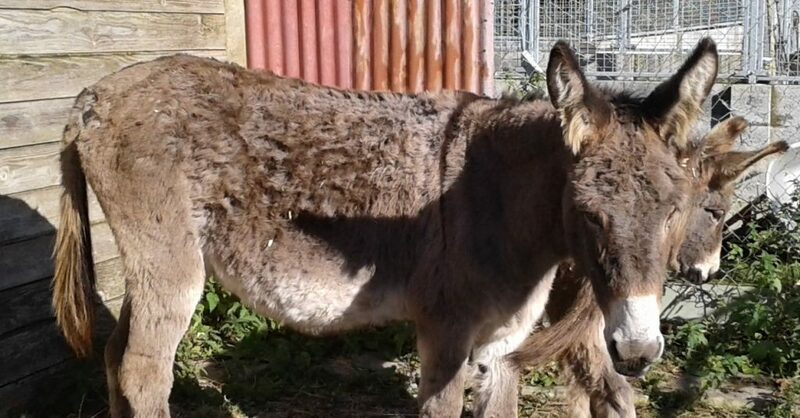 Between the recent castrating of the all the male potbellies & donkeys, chipping & passporting of donkeys, a kitten operation, dog cruelty case, etc our bill at Ballyhugh Veterinary Clinic in Gort is currently over €1,000. If you would like to knock a bit off our bill for us we would be delighted. Their phone number is 091631725 or their address is Tubber Road, Gort, Co Galway. 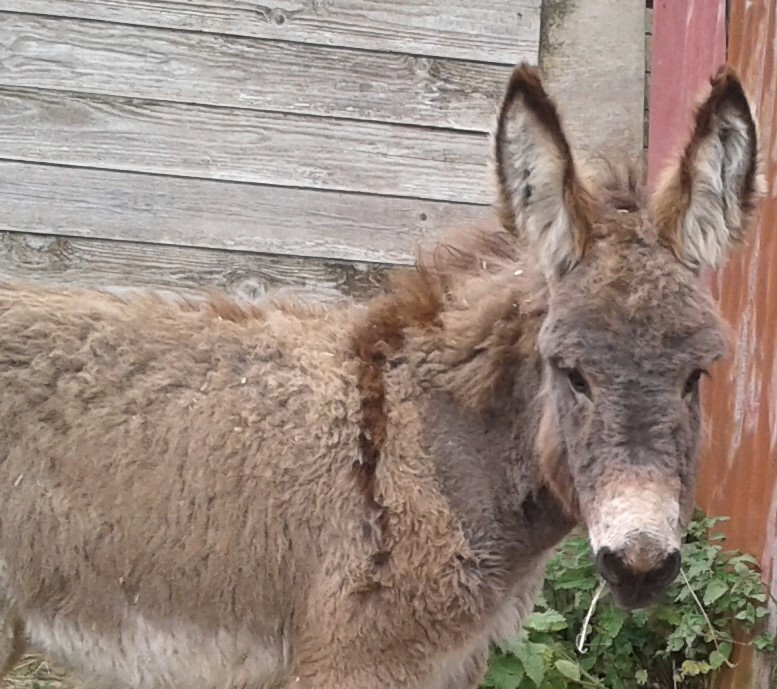 Unwanted, abandoned & neglected … left into our neighbour’s field for us to find. 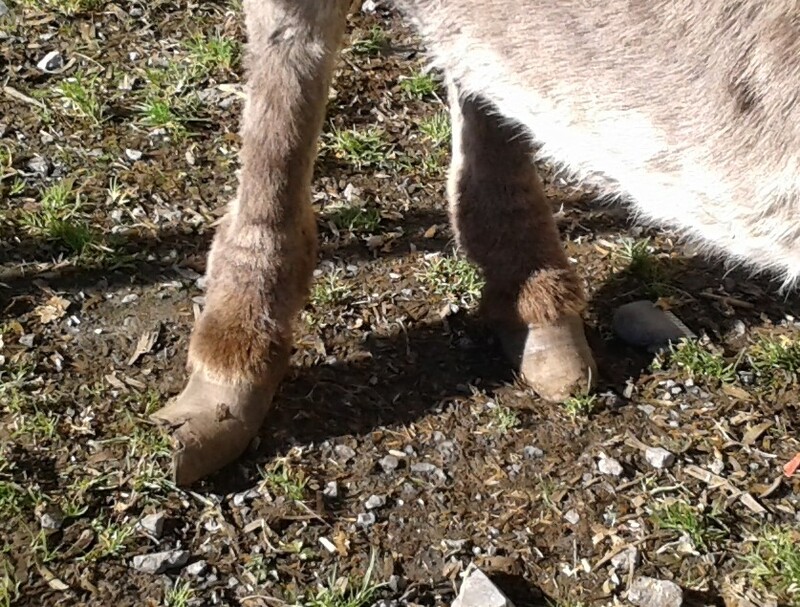 Cria has lots of bald patches & cuts from rubbing herself due to a severe lice infestation, now that we have finished worming her we can see how underweight she is and no two of her hooves are the same shape or size. 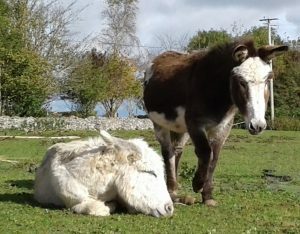 Eeyore, being only a baby, is not as bad as his mum as obviously he had her milk to keep him going. Needless to say he did have worms and had also to be treated for lice. 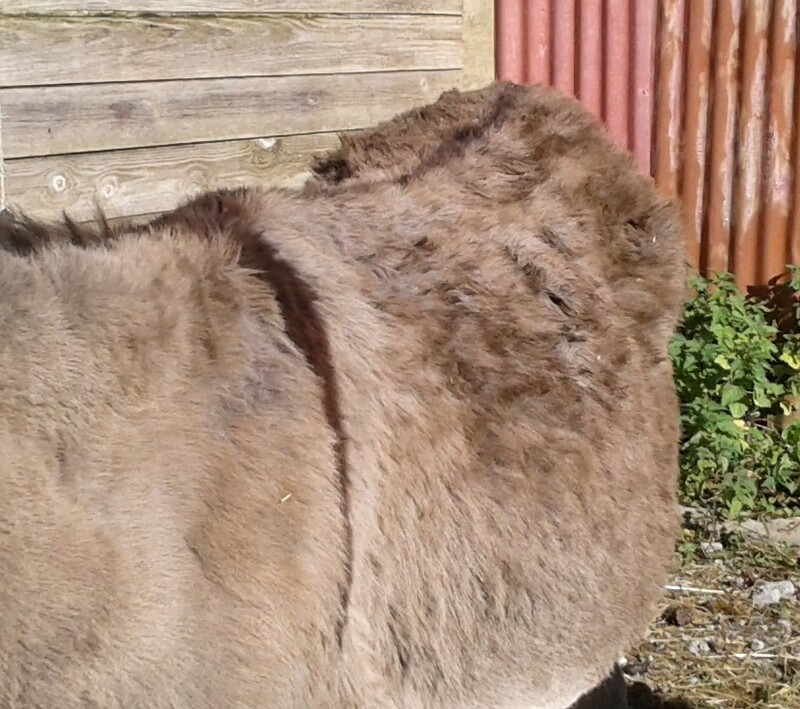 On account of the sores on Cria’s back and the state of her hooves we have had to keep them in our quarantine area. 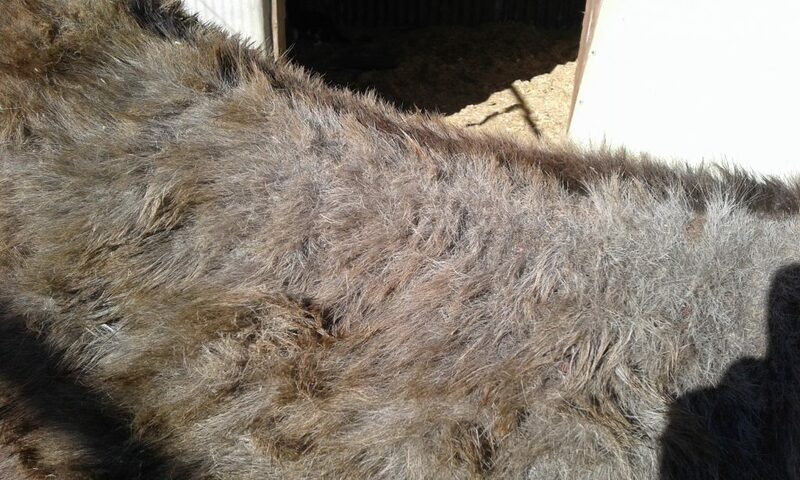 It is highly likely that we will have to rug Cria for the winter as her skin will not be able for rain or cold this year. 2. Earlier this month we got several calls about a dog in need of help … sadly all we could do for him was end his suffering but we would like to thank the people who called us for taking the time to find help for him and also the guards who assisted in getting him surrendered. 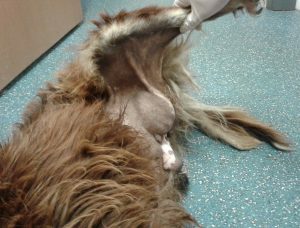 If this dog had been seen by a vet sooner his tumour could have been successfully removed and he need not have gotten to the stage of pain or emaciation that he was at. If you know someone who is unsure about getting their dog neutered please tell them that the risk of testicular tumours is a very real one and it is far more in the dog’s interest to have the snip in the long run. 3. 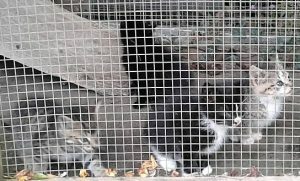 A litter of kittens, no more than 4 weeks old, were found in the Gort area by a stream with no neighbouring houses. Thankfully for them it was a vet nurse who discovered them and got them to safety. She got 4 of them drinking & eating from a bowl but the smallest one would only take milk from a syringe. The following day we collected the kittens and got them settled in. Sadly 3 days later the littlest one died despite us continuing to feed him formula milk through the syringe. We are hopeful that the other 4 will continue to thrive and that they will be available for rehoming in the middle of November. So that’s it … you have gotten to the end of our October report. We are keeping our fingers crossed that the remaining days of the month are filled with more ‘good’ category news so that we can spread some positivity on these shorter daylight days.